Happy 2018 to your beautiful self! New year, new you, for real. To kick off the new year at Saint Salon, we have been spending lots of time with our friends and family. Who is that? You guys of course. 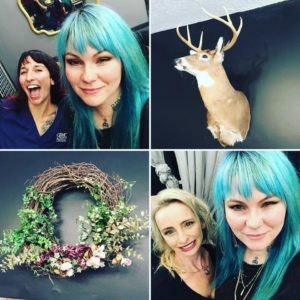 The salon is much more than ‘simply getting your hair done’. It’s an experience and we try to make it the best one you have ever had. Yes, you leave with beautiful hair, but you also leave feeling good. Really good. Beyond good. A little human interaction goes a long way, and if you have never been here before, be prepared for a fun day. We look forward to seeing you, cheers to an amazing 2018. ← Saint Salon Now Open in Joppa Maryland! Saint Salon Now Open in Joppa Maryland!